Using a thermosiphon solar water heater systems is an excellent way to start saving on your domestic hot water heating bills. The tank must be above the collector, so the thermosiphon phenomenon can occur, circulation water from collector to tank. 1. Can be operated completely automatic if connect with intelligent controller. 2. Simple structure, easy plug-in installation, can be installed both on flat and inclined roof, and can be used with an auxiliary electric booster as to provide hot water without sunshine. 3. Superior heat preservation ensured by one-off molding polyurethane foam with thickness 50-65mm. 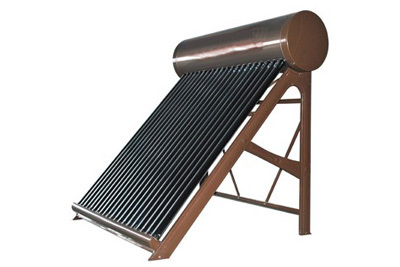 Non-pressurized solar water heater can pressure you? Vacuum tube is not the problem, but the tank seal is the commitment not pressure. Such is not. Solar will perish. The reason is very simple to do as you say, you have to exhaust blocked, otherwise the water will run out from the exhaust, blocked exhaust the question came, this time is put into the cold water hot water do not come out. Certain suction will tank suction broken gap type solar water heater tank liner is too thin. Also even if the suction is not bad, bad will inflation. Cold water heated expansion, there is no place overhauled to give the tank, there are all sealed mouth a lot of pressure, and they can not afford a lot of pressure, so all seal leaks, the tank will be inflation bad.